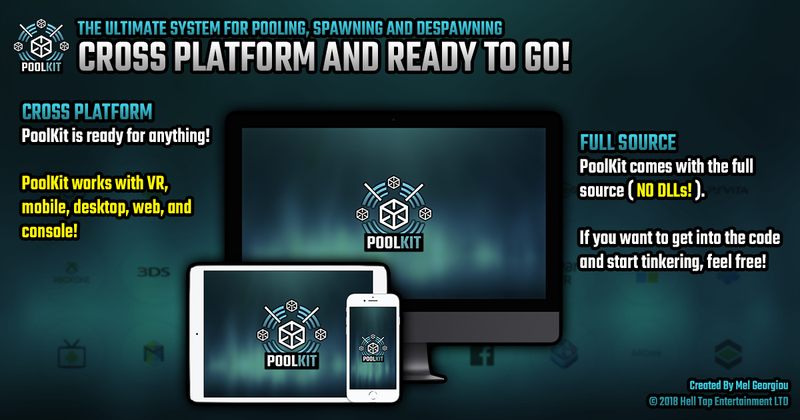 Introducing PoolKit, a truly next generation system for pooling, spawning and despawning. Ever heard of “Pool Types”, “Chain Spawning” or “Automatic Despawning”? 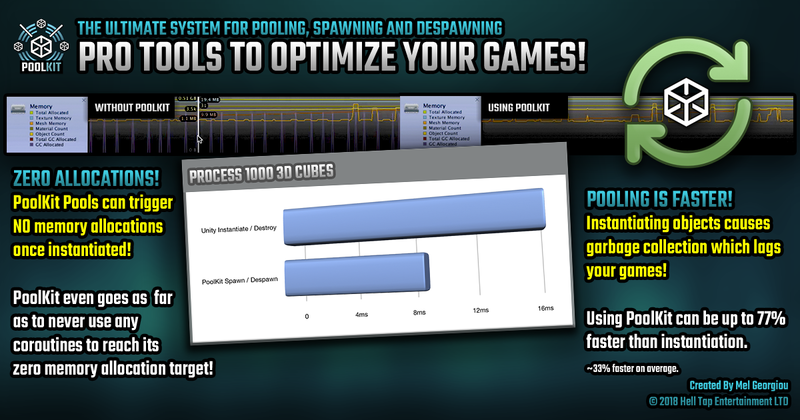 Among many other concepts, PoolKit is first to offer these unique and innovative pooling features in an easy to use, streamlined and professional series of tools to help you annihilate memory allocations and improve the performance of your games! 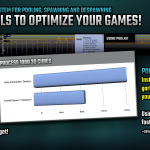 PoolKit offers unique performance boosts unavailable in other systems. PoolKit is a unique solution that tackles the problem of garbage collection which comes from instantiating objects. These memory allocations can cause huge spikes and “stuttering” in gameplay. PoolKit can uniquely pool and spawn your prefabs with ZERO garbage collection which can be up to 77% faster than instantiation (~33% on average) and helps to make your game a smoother experience which is increasingly needed on platforms like mobile and VR! 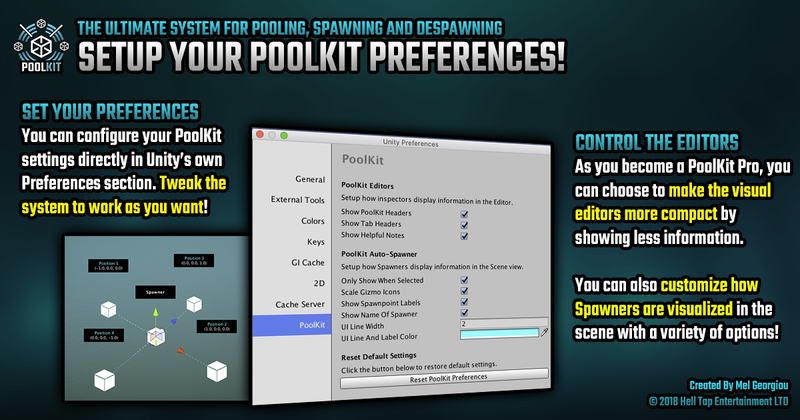 PoolKit also thinks about how you work in Unity and comes with it’s own powerhouse of a Spawner. 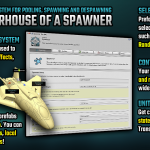 This can be used to create enemies, special effects, weapon systems and more! 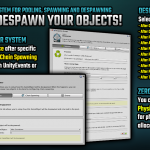 In addition, an incredibly powerful all-purpose Despawner component can be attached to your gameobjects to despawn them after they are triggered by countdowns, particle systems, audio sources, physics collisions or scripts. 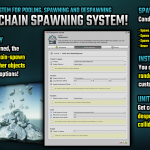 It then allows you to setup “Chain Spawning”, a specialized despawner feature to spawn any number of new instances to replace a despawning object. 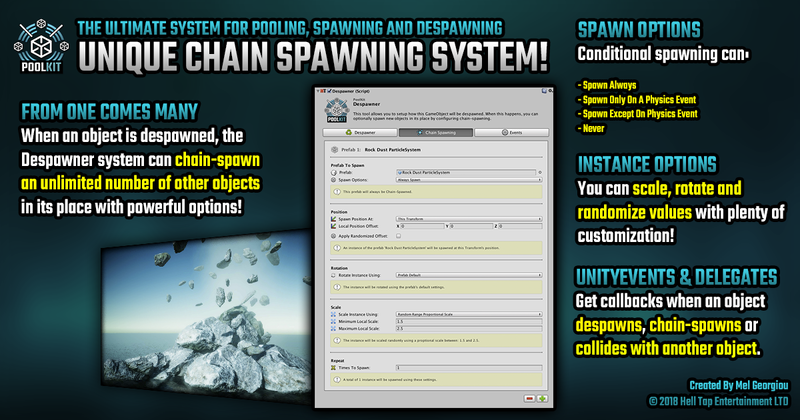 Complete Solution For Pooling, Spawning, and Despawning! Easy To Use Visual Inspectors! Use “Pool Types” to select the data architecture of each pool! 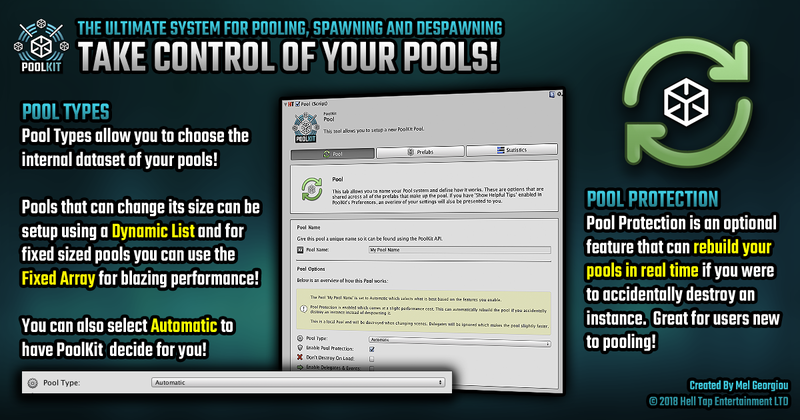 “Pool Protection” can rebuild your pools in real-time! Pools can be local to a scene or global to many or all scenes! 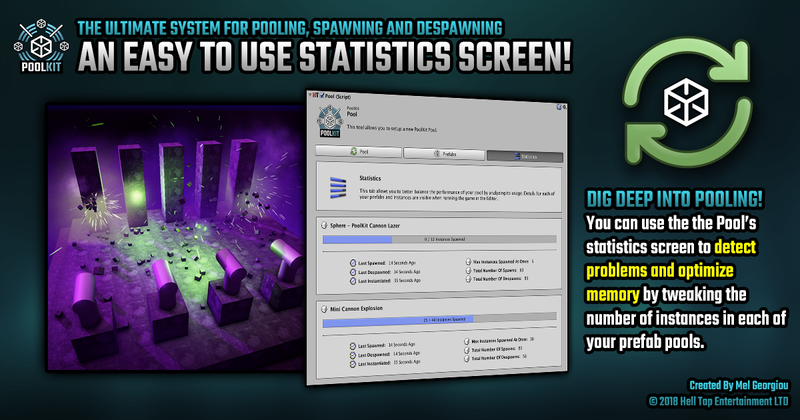 Automatically create global pools when the game starts! “Instance Recycling” can re-spawn existing instances! “Preloading” can create instances over time! 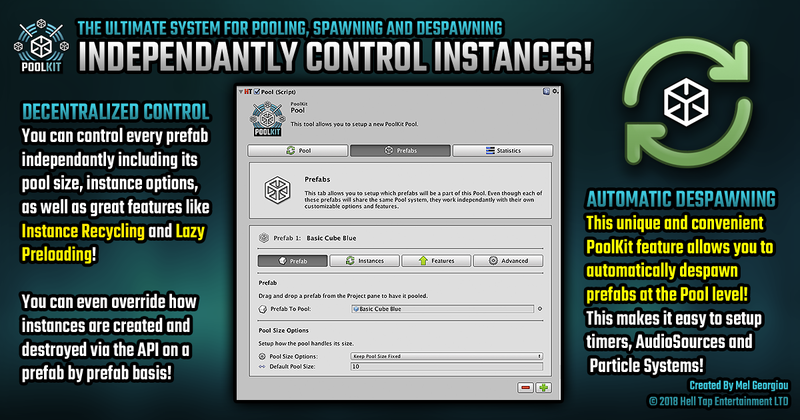 Instances can have “Automatic Despawning” setup via the pool! Recieve Notifications when specific prefabs change state. Unique scripting interface offers blazingly fast notifications! 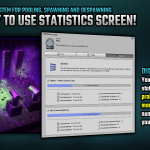 Advanced Spawner to spawn enemies, weapons, effects and more! 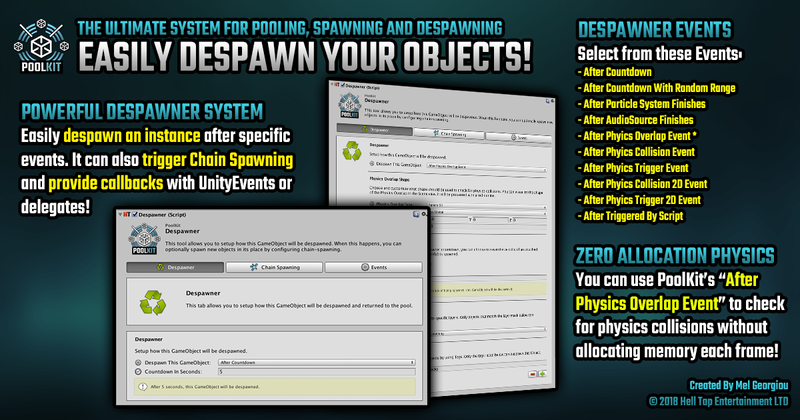 Powerful Despawner to configure events that despawn your objects! Unique Chain-Spawning System built into every despawner! Cross platform and works in 2D & 3D projects! Comes with 5 Tech Demos and 9 Example scenes! Documentation PDF and High quality video tutorials! Fast and friendly email support! Requirements – Unity 5.6.x, Unity 2017.x, Unity 2018.x or higher. In this first Pool Kit tutorial, we take a complete look at setting up various types of Pool. In this video, we explore setting up a lazer cannon scene. We take a complete look at Spawners and Despawners as well as focusing in on the Chain-Spawning feature. 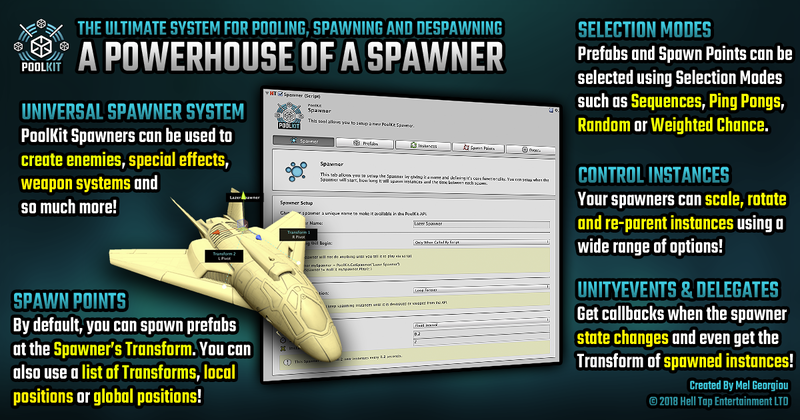 Prefabs can now be minimized and expanded in the Pool Editor. First commercial release of Pool Kit. 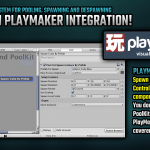 Are you ready to integrate the ultimate unity pooling system? 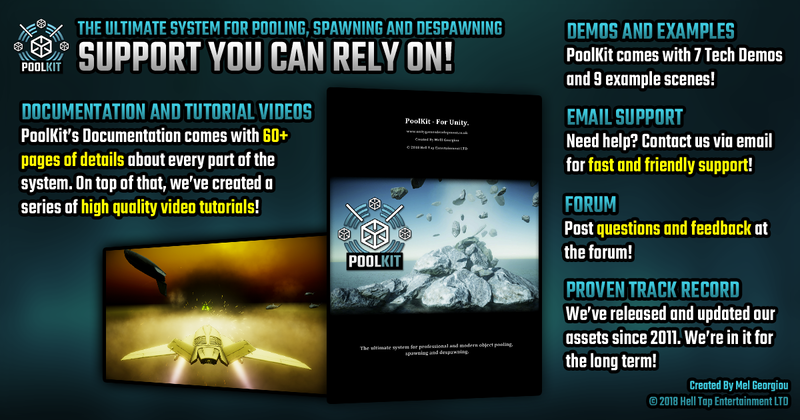 Buy the PoolKit plugin now!